This thermostat is designed specifically for warm weather climate vehicles. The thermostat regulates your Discovery Series II’s operating temperature by restricting the flow of coolant from the engine back to the radiator. If your Land Rover is overheating, a faulty thermostat may be your problem. It's important to switch out a bad thermostat at the first sign of failure, or risk suffering further, costly damage to other engine components. 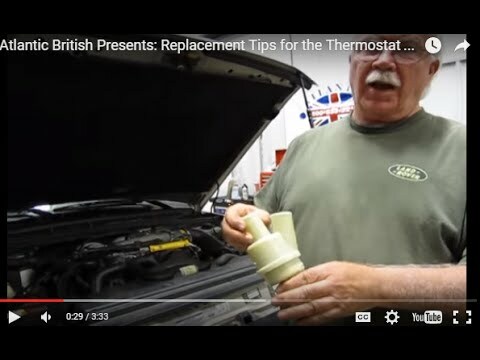 Atlantic British Ltd. Repair & Maintenance Academy How-To Video: Watch Jim as he gives his tips in the replacement of the thermostat of a Land Rover Discovery Series II, 1999 - 2004. Questions about this video? Call us at 1-800-533-2210 or contact us via live chat. Had to replace a radiator and water pump, and decided to update other cooling parts at the same time. Noticed my engine temps fall from a slightly worrying 214 to 203F idle. Can't confirm a 100% cause and effect but I'm sure it helped lower it more than the old tstat. Highly recommend to anyone in the southeast US. it fits and works but it runs warmer than the factory model. I did not pay close enough attention to the pic and if I had I would not have bought this brand. Installed this 180 F thermostat in my 2003 Disco, and now have a much happier, cooler running engine for the California climate.